As the forces of Devaloka and Patala, led by Indra and Shukracharya, plot to possess the Halahala, Shiva turns to mankind to guard it from their murderous clutches. It is now up to Samrat Vikramaditya and his Council of Nine to quell the supernatural hordes – and prevent the universe from tumbling into chaos! Shatrujeet Nath has sold ice creams, peddled computer training courses, written ad copy and reported on business as a journalist and assistant editor at The Economic Times. His first book, The Karachi Deception, was published in 2013. He divides his time between writing fiction and poetry, reading, playing with his daughter, and dreaming of buying a small castle in Scotland. Till that happens, he plans to continue living in Mumbai. I normally start reviews with a formal introduction, but today, I can’t. I am intoxicated, drugged, and floating in a world that has come to conquer my senses since the last few days. The world of Vikramaditya. The world carved by author Shatrujeet Nath. Let’s get it straight. Historical fictions are the current flavour of the season. There are several authors who have delved into history, bringing alive the characters about whom we have read in schools, or heard from our grandparents as a part of after – dinner tales. 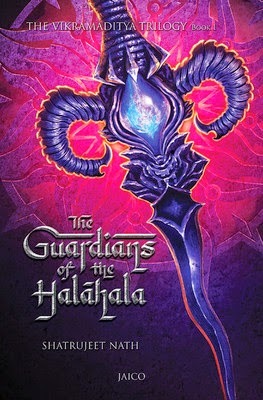 There are stories of Gods and Goddesses, Kings and Queens, interpretations of epics, and then there is ‘The Vikramaditya Trilogy.’ I wouldn’t be exaggerating if I say that the first book in the series – ‘The Guardians of Halahala’, promises us the creation of an entirely new historical saga, in a dimension unparalleled and completely unmatched. The author has introduced a lot of characters in the book from the pages of history, albeit in a new light. Literary liberties have been taken, combining facts with fiction, which make the plot all the more fascinating. The kingdom of Avanti turns out to be a site of valour and courage, with King Vikramaditya at its helm. The nine gems of his court, Amara Simha, Dhanavantri, Kalidasa, Kshapanaka, Vararuchi, Varahamihira, Ghatakarpara, Shanku and Vetala Bhatta display utmost dedication to their king and the population of Avanti. They symbolise love, trust and devotion, signifying a bond of friendship so deep that one will be enthralled simply by reading about them. When Lord Shiva approaches Vikramaditya with the remaining portion of halahala, the deadly poison, we know that the story will go all the way upwards henceforth. And that’s exactly what happens. The brilliant narrative by the author, describing the events in the most minute of details makes us a part of the scenes. It’s like we are the first hand viewers of everything that’s unfolding in the book, breathing in the imagery that’s promising and excellently carved. The war scenes, when the Devas and the Asuras attack the gates of Avanti, are written in a very realistic fashion, and on several occasions we feel we ourselves are a part of everything that’s happening in the pages. Thus, as a reader you pray for Vishakha’s cure, you wish that Avanti emerges victorious, and you hope that Vikramaditya doesn’t have to pay too hefty a price for protecting the halahala, ‘cause it’s something that both Devas and Asuras lust for. What disappointed me was that this was just the first part of the trilogy, and I have to wait for the next one. Having being totally mesmerized by the ‘The Guardians of the Halahala’, it feels difficult waiting for its sequel ‘The Conspiracy at Meru’. I request the author to bring that out soon, so that we the readers could continue our journey with Vikramaditya, his nine gems, and the kingdom of Avanti. Most of us have read or watched on television the adventures of Vikram and Betaal. This is where the author delivers a masterstroke by making Betaal a part of this story, thus binding every spots together in the plot, devoid of any loopholes. ‘The Guardians of the Halahala’ is as perfect as it can get, and if the first book in the series is any indication of what’s next to come, then ‘The Vikramaditya Trilogy’ can very well emerge as a modern day masterpiece. Exactly my thoughts as well. I was completely blown away with this book. One of the best I have ever read. really good. it enthralls my mind a must read for every one.